The outdoor kitchen is gone y’all. 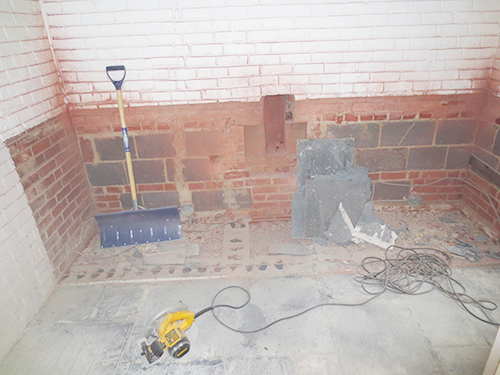 It took a long time and a lot of work on Mark’s part, but we finally demolished all the brick as well as the stone tile that was in front of it. Unfortunately, it didn’t go all the way to where the other floor started. There’s a slab of concrete (probably the original outdoor patio) in between the two. Unfortunately, the concrete is a little bit higher than the rest of the floor. We noticed this even before we took up the carpet and tiles as you can tell when you open the door to the backyard and the door scraped the floor a little bit. We want a completely level floor out there so Mark plans to rent a concrete saw so that he can cut down the concrete patio so that it’s lower that the floor joists. Then he will have to pour new concrete so that’s its level and flush with the rest of the floor. I’ll have a more detailed post explaining this step once we get started. As seems to be par for the course with this reno, it’s not going to be an easy job, so who knows how long it will take to complete. But back to what we have already accomplished. 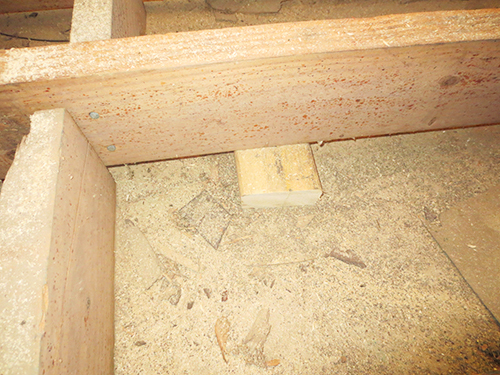 I mentioned in the last post the we needed to shore up some of the floor joists. 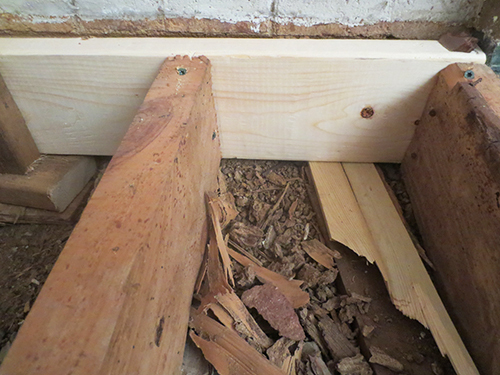 To do that, Mark simply placed a piece of wood under the beams that had too much flex or give in them, like this. This, of course, will make the whole floor more stable and secure and prevent dips and creaks. 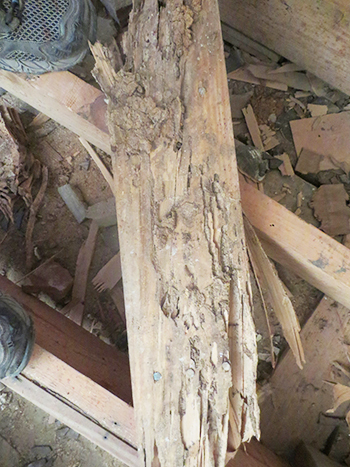 We also had a small area where the wood had rotted so we replaced those beams with new ones. 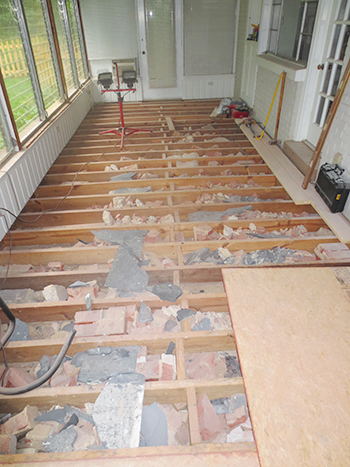 Once the joists were shored up and the rotted wood replaced, we could start filling in with debris from the kitchen. 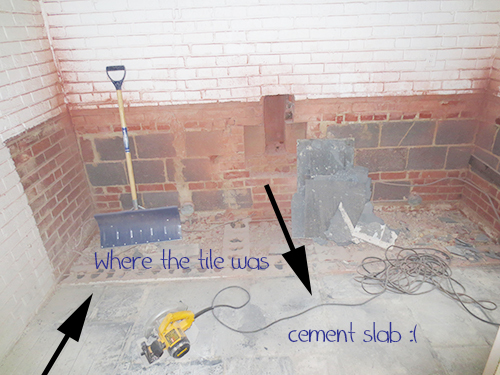 As I mentioned here, after our first trip to the dump cost us over $40, we decided we could simply “bury” the broken brick, etc. under the floor where the “storage” is free. So now we’ll grind up the concrete and get to work on laying the sub floor. 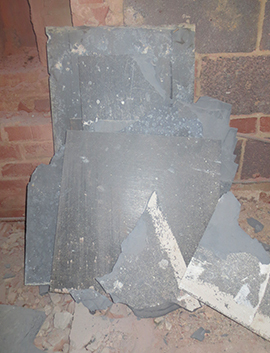 Turns out that there’s a few different sub floor options we can go with and we’re still deciding what will work best. We’ll let you know where we land.